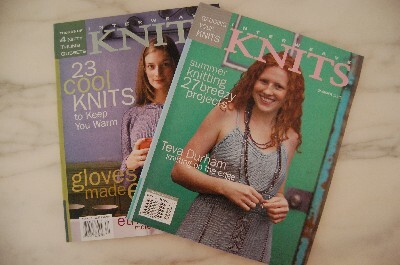 More pressies in the post – the lovely Blueadt sent me some IK back issues in exchange for some surrogate retail therapy. Thank you! They are in perfect condition (from winghamwoolwork). The patterns look great – I’m waiting for the Favorite Sock book, and in the meanwhile the two slipper patterns in the two back issues will keep me more than occupied! 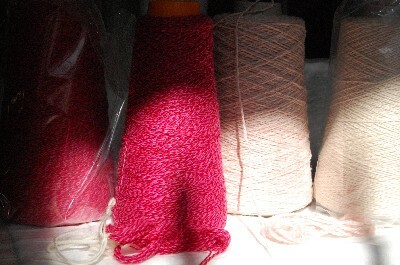 Some piccies of the cashmere – for some reason I got two cones of the pink. I can only assume that each cone is half of it, or maybe i got lucky. The coned yarn needs to be washed (still greased or something). I washed the hank at the bottom there – you can see a strand of the washed once its bloomed, and a strand of the unwashed to its left. Much thinner! 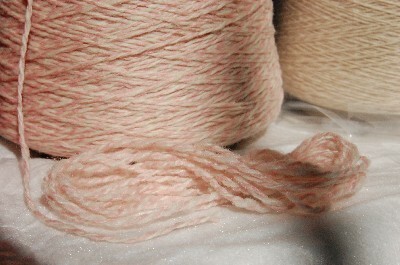 This is the DK in marshmallow – very slightly pink. The bloom isn’t quite as pronounced, but it is still there. 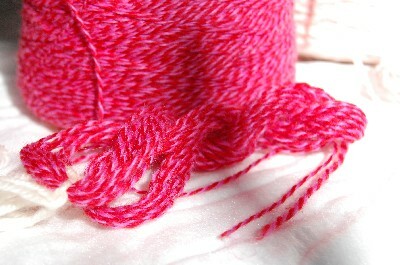 Will knit up some swatches and see if the 2mm needles are small enough. Very soft stuff! Lovely yarn – you could always use it doubled if it is coming up too thin – otherwise I do have some 1.5mm dpns I can lend you! Very pretty. I have heard great things about the sock book, can’t wait to hear what you think.